Ikat is a resist dye technique used to pattern textiles. The more common methods of resist dyeing involve covering parts of a fabric to shield the reserved areas from penetration of the dye, as in tie-dyeing, where threads are wound around the fabric, or in batik, where wax is applied to the surface of the cloth. The term "ikat" by contrast, is used for a process where prior to weaving, warp (lengthwise yarn) or weft (crosswise thread) or sometimes both are tied off with fiber knots that resist absorbing color and are then dyed. To facilitate the pattern tying, the threads are set up on a frame. They are then grouped into bunches of several threads to be tied at once; this results in the creation of knot units from which the overall pattern is built up. Resist ties are removed or new ones added for each color; their combinations create the design. After dyeing is completed, all resists are opened, and the patterned yarns are woven. The word "ikat" comes from the Malay-Indonesian word for "tie"; it was introduced into European sources of textile technology and history in the early twentieth century when Dutch scholars began paying attention to the rich textile traditions of the Netherlands Indies, the present-day Indonesia. 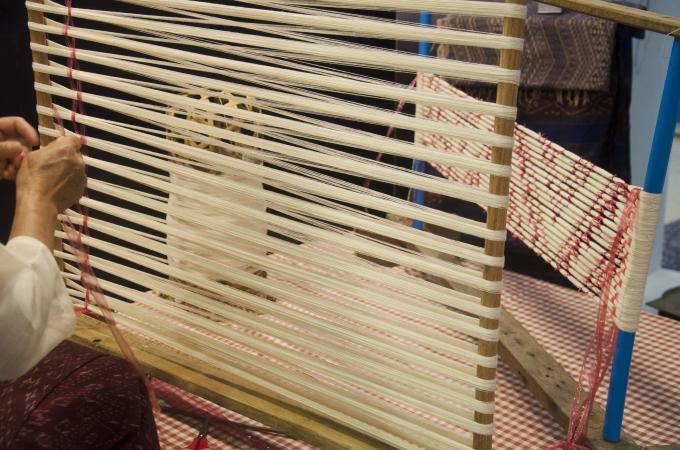 Depending on whether the tied fibers are applied to the warp or weft, the technique is identified as either warp ikat or weft ikat. A third variety, double ikat, combines both warp- and weft-tied resist. For the pattern to be visible, the resist-dyed thread system has to be the prominent one, so for warp ikat, the weave has to be warp-faced, and weft ikat needs a weftfaced structure, which means that either warp or weft is predominantly visible. Plain weave is especially suitable for showing the ikat's design, but for weft ikat, a twill weave may also be used. Double ikat, where the design is built up from both systems, should ideally by woven in a balanced weave, with warp and weft equally visible. All textile fibers may be used for ikat, although silk and cotton are the most common ones. For the seminal study of ikat as a resist dye technique, its history and geographic distribution, see Alfred Bühler (1972). While it is not known when and where the resist technique first developed, Asia has several cultural regions with a particularly strong ikat tradition. Maritime Southeast Asia, India, and Central Asia are all potential candidates for the origin of the technique, but it may also have evolved independently in several locations. Ikat may have spread at an early age through many parts of the Austronesian-speaking world, as technical similarities exist between Indonesian ikat production and that of Madagascar, which was settled by maritime Southeast Asians early in the first millennium C.E. As Malagasy weavers also use a distinctly Austronesian version of a horizontal back-strap loom, the technique may have arrived simultaneously with the spread of loom technology. Ikat patterning is probably represented in garments shown in the Ajanta cave paintings of India (from the fifth to the seventh century). A fragment patterned in the technique, kept for centuries in the Horyuji temple at Nara but now in the Tokyo National Museum, was apparently brought there from China during the Tang period (618-907 C.E. ), but was probably produced in Central Asia. Cotton textiles with relatively simple warp ikat stripes were made in Yemen by the eighth or ninth century and were traded to Egypt, where they have survived. Early ikat production is also testified for pre-Columbian South America, in particular Peru, where a few examples of ikat survive from before the common era. The Mapucha of Chile still produce indigo-dyed warp ikat textiles. Guatemalan ikat, on the other hand, may have been introduced originally as trade textiles brought by the Spanish from the Philippines and could ultimately have a Southeast Asian source. West African weavers also make use of the technique, in particular in Ghana, the Ivory Coast, and Nigeria. In the Mediterranean world and Europe, ikat apparently developed in response to Islamic textiles; it first appeared in Italy in the seventeenth century as an influence from warp-ikat striped mashru cloth (a warp-faced satin weave with silk warp and cotton weft) made in Syria and Turkey. For its spread through Europe, especially France, Majorca, and Spain, see Marie-Louise Nabholz-Kartaschoff. Nineteenth- and twentieth-century evidence show that at least during the last two hundred years, Asia produced the most varied and highest quality ikat textiles, and a survey of the technique will inevitably have the continent as its main focus, although the occurrence of ikat worldwide needs to be acknowledged. Particularly fine material survives from India, Central Asia, Southeast Asia, and Japan. China, otherwise of course a producer of quality textiles, apparently has not developed the technique to any degree, at least outside its Central Asian provinces. India and Southeast Asia are the geographical regions with the greatest diversity of ikat weaving, with all three technical versions present and developed to an unrivalled variety of designs. 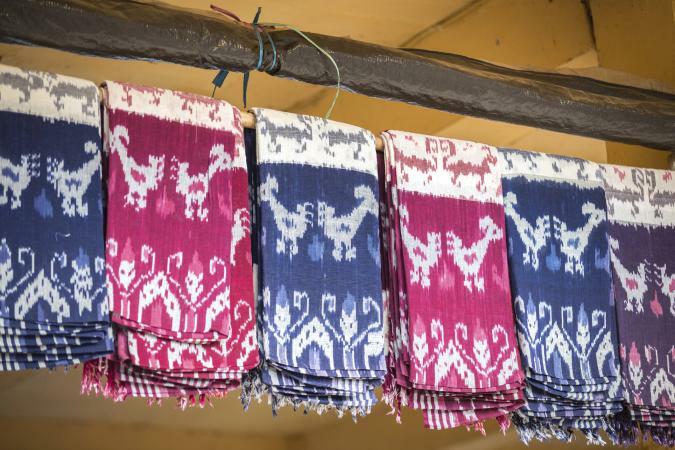 In India, Andhra Pradesh, Orissa, and Gujarat are best known for their ikat traditions, but Tamil Nadu in southern India also once had an active production. The most famous, and complex, of ikat textiles are the patola (sing. patolu) of Gujarat. These double-ikat, sari-length silk cloths are in the early 2000s only made by a small group of weavers in Patan. Their designs require great precision in planning and setting up of warp and weft, as the desired effect is a clear outline of patterns, rather than the softly blurred appearance characteristic of many ikat traditions. Patola are still worn as saris in India, but they also have ceremonial functions, such as at weddings, where they may be used to drape the bride and bridegroom. For centuries, patola were not only made for an Indian clientele, but were also luxury trade items. Their international reputation as high-quality export textiles was already established in Southeast Asia when the first Europeans became involved with the maritime trade of Asia in the early sixteenth century. The Portuguese and later Dutch and English traders discovered that patola were essential exchange items for establishing local contacts in the lucrative spice trade. Patola made for the Southeast Asian market were usually smaller in size than the sari-length textiles found in India, and they had distinctly different designs. Patola imitations in weft ikat are produced in Rajkot in Saurashtra, western Gujarat; these use conventional patola designs but are garish in colors and technically less ambitious. Andhra Pradesh and Orissa produce both cotton and silk warp and weft ikat, sometimes using both in a single cloth, such as the telia rumal handkerchiefs made in Chirala, Andhra Pradesh. Warp and weft may be matched to create simple double ikat patterns, but more often warp and weft ikat are placed separately in different parts of the textile. Tamil Nadu and Karnataka in southern India formerly produced fine cotton and silk sari with very simple ikat bands. Southeast Asia has a strong warp ikat tradition, usually worked on cotton. Particular highlights are found in Sarawak (Borneo) among the Iban, the Toba Batak of northern Sumatra, and throughout eastern Indonesia, specifically on Sumba, Roti and Savu, Flores, and the Solor Islands. Weft ikat is most commonly associated with silk weaving and is found predominantly in mainland and western maritime Southeast Asia; it occurs in Cambodia among the Khmer, in southern Sumatra, and (as a cotton version) on Bali. Double ikat is only found in Bali in the village of Tenganan, where the ceremonially important cotton geringsing cloths are woven. The designs used in Southeast Asian ikat combine indigenous motifs with outside influences, as they incorporate patterns that go back to the region's prehistory, with a response to Indian textiles. Particularly relevant are the patola formerly traded from Gujarat, which had a major impact on local ikat textiles. Central Asia produces silk warp ikat garments, in particular coats worn by men and women until the early twentieth century. These were made by specialist weavers and dyers in the city-states along the Silk Road, often involving the local Jewish communities, and were worn as heavily quilted outer garments, as well as undercoats without cotton padding. These robes are characteristically dyed with vibrant colors and large-scale designs; unlike some other ikat traditions that may place importance on a precise outline of patterning (the patola of Gujarat and warp ikat textiles from Borneo and eastern Indonesia), the bold effect is the desired aesthetic achievement, rather than a clearly defined motif. In East Asia, ikat continues to be commonly produced in Japan. It was traditionally only dyed with indigo, although other colors have become used as well. One finds both warp and weft ikat, often combined into double ikat patterns. Balance Weave: A textile structure in which the number of yarns in the lengthwise direction and the number of yarns in the crosswise direction are similar in size and number. Warp/Warp Yarn: Lengthwise yarns in a woven fabric. Warp-Faced: Fabric in which the lengthwise (warp) yarns predominate on the surface of the fabric. Weft/Weft Yarn: Crosswise yarns in a woven fabric. Synonyms: filling, woof. While ikat production in India, Central, and East Asia is done in commercial or craft industry-oriented workshops and is mainly carried out by men, the tying and weaving of ikat in Southeast Asia is definitely a female activity. The textiles of the region are often associated with ritual and ceremonial functions that concern both individuals and the community. They may be presented as gifts at marriage and funerals, or may be essential paraphernalia for ritual cycles and ceremonies. Even when they are made to be used by men, their production is inevitably closely linked to the female aspect of society, both in mainland and maritime Southeast Asia. Ikat continues to be produced in the early 2000s, especially in Southeast and East Asia. 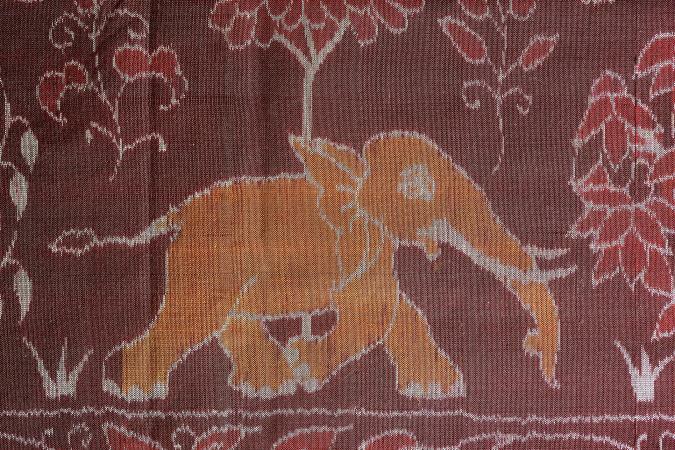 It may also have a revival in India, as traditional crafts there experience a certain renaissance. Ikat textiles are used for both dress and display purposes. They can be appreciated for their decorative beauty alone, but because a complicated pattern is difficult to achieve in this technique, especially when several colors are part of the design, ikat garments may carry a high prestige value as well. This is apparent in the use of patola as costly sari fabrics worn by women in India; it also contributed to the local appreciation of ikat garments in Central Asia, where the robes were considered most prestigious if they included several colors, as this implied the repeated tying of the warp threads and further dyeing, which is both time-consuming and technically demanding. Although most ikat textiles produced in Southeast Asia are used as garments, such as the wrap-around sarong or an open shoulder cloth, they may in addition acquire a considerable ceremonial importance. They are produced by women and therefore have become closely associated with the status females have in the region, which in general is high and inevitably is linked to concepts of fertility. The ikat textiles are frequently a prescribed part of elaborate gift exchanges accompanying a wedding. Textiles with a ceremonial function often use designs and color combinations that are considered traditional in the local context; comparing current patterns to those found in early museum collections can provide confirmation that designs have been established for several generations and continue to follow certain conventions. Ikat textiles made for daily wear, on the other hand, display local fashions in both design and color and may change relatively quickly. See also Dyeing; Resist Dyeing; Plain Weave; Twill Weave. Bühler, Alfred. Ikat Batik Plangi. 3 vols. Basel, Switzerland: Pharos Verlag, 1972. Bühler, Alfred, and Eberhard Fischer. The Patola of Gujarat: Double Ikat in India. 2 vols. Basel, Switzerland: Krebs Verlag, 1979. Crill, Rosemary. Indian Ikat Textiles. London: Victoria and Albert Museum, 1998. Fitz Gibbon, Kate, and Andrew Hale. Ikat: Silks of Central Asia. The Guido Goldman Collection. London: Laurence King, 1997. Maxwell, Robyn. Textiles of Southeast Asia: Tradition, Trade and Transformation. New York: Oxford University Press, 1990. Nabholz-Kartaschoff, Marie-Louise. Ikatgewebe aus Nordund Südeuropa. Basler Beiträge zur Ethnologie Band 6. Basel, Switzerland: Pharos Verlag, 1969. Tomita, Jun, and Noriko Tomita. Japanese Ikat Weaving. London: Routledge and Kegan Paul, 1982. Zerrnickel, Maria "The Textile Arts of Uzbekistan." In Uzbekistan: Heirs to the Silk Road. Edited by Johannes Kalter and Margareta Pavaloi. London: Thames and Hudson, Inc. 1997.